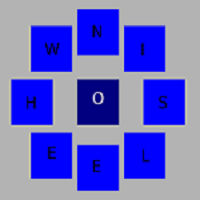 Wheelsin, a puzzle game to turn boxes to reconstitute a pattern. Wheelsin is a game of puzzle and a mind game. Wheelsin offers different grids 6 x 6 squares, of various levels. The objective is to move some boxes to obtain a provision imposed from the start. To move the boxes you must first press or click on an inner box. The eight neighboring squares instantly form a circle. You can rotate these boxes in the direction opposite to the clockwise by clicking outside the Central box, or by dragging the pointer. To release the wheel and save the layout, simply press again on the central square. This original game is suitable for all public. The difficulty varies from one grid to another. The game is available on Windows 8.1, WindowsPhone 8.1 and Windows 10 operating systems.